Making music, making blips and bleeps, turning knobs, plugging in keyboards, and having the freedom to modify your gear – these are good things. And that’s why I’m so excited that today is the day the MeeBlip launches. It’s been several years in development, but now it’s finally here. It’s a hardware box that makes noises – virtual analog synth noises, chip-sounding noises, good noises, bad noises, noises you can make into music. It’s got physical knobs and switches on it, plus a MIDI DIN in port so you can connect that keytar you bought on eBay. It’s also a digital synth you can build, modify, and hack, down to the way every knob is mapped and every sound is blipped. The MeeBlip is the creation of James Grahame, of Retro Thing and Reflex Audio fame. (He tells the full history of how it came to be.) But we’re serious about the Create Digital Music name going on there, too. We’ll be documenting and helping develop this instrument for some time to come, and we’ve begun building a site and community for the instrument so you have a place to meet other people using it. The MeeBlip, from code to schematics, is open source hardware. You can hack it, read through the code, make your own and sell it. At the same time, just because it’s “open source” and “hackable” doesn’t mean the MeeBlip is just for hackers. On the contrary – we wanted a synth anyone could play. With the Quick Build Kit, you can assemble the MeeBlip without a soldering iron or, really, much skill, in a matter of minutes. 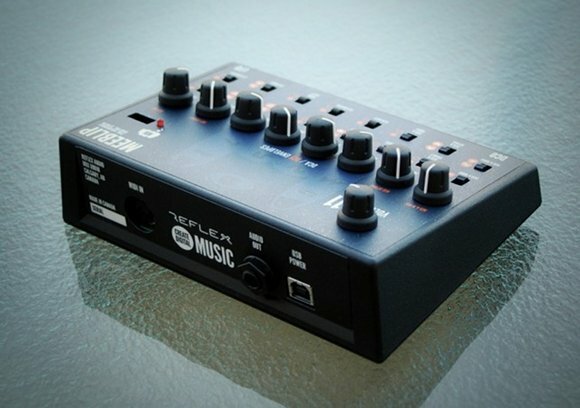 Plug it in, turn some knobs, and you can make some sounds. And if later you decide you want to go deeper or even change the way the instrument works, you can do that, too. You can hear what it sounds like with some samples I’ve uploaded to SoundCloud. This is the MeeBlip completely raw – no effects, no sequencing, just me playing live and turning knobs, right into Ardour. Enjoy. 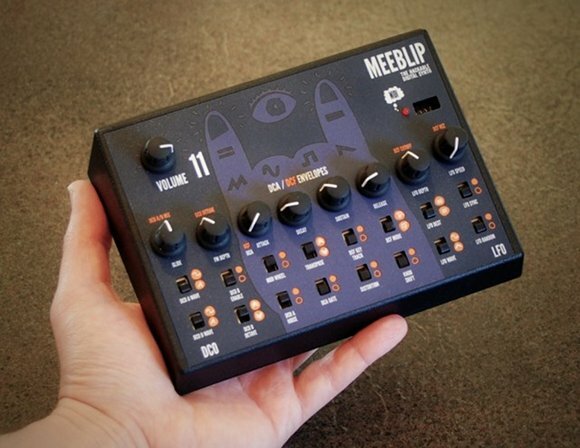 I’m personally thrilled that the MeeBlip goes from being silent to making some serious noise. The MeeBlip sports front-panel illustrations by designer Nathanael Jeanneret.